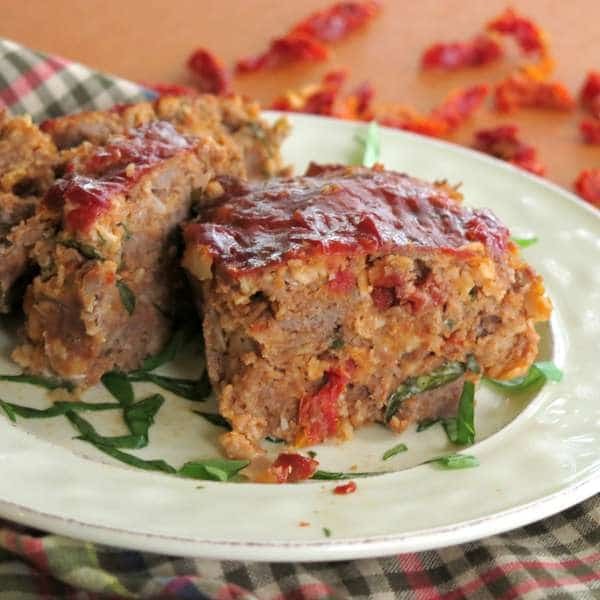 Gourmet Meatloaf with Mozzarella and Sun-dried Tomatoes is also stuffed with Parmesan cheese, onion, fresh basil and uses oatmeal so it’s healthier and gluten-free. Whether you make muffins, meatballs or a full-size loaf, it’s a “gourmet” recipe your family will beg for again and again! This is no ordinary meatloaf. Hands down…it was a top-requested recipe from our make ahead meal kitchen. We even had a customer order some on the way to the delivery room…so it would be tucked away in her freezer when she got home from the hospital. Truly! It’s good. Really good. Not only is it moist and delicious, but it freezes beautifully and can be packaged so many different ways depending upon your family size and needs. I love the ease and portability of the muffin size, but the same recipe is used for a full-sized pan. I have become a bit of meatloaf fanatic and love experimenting with the basic recipe. 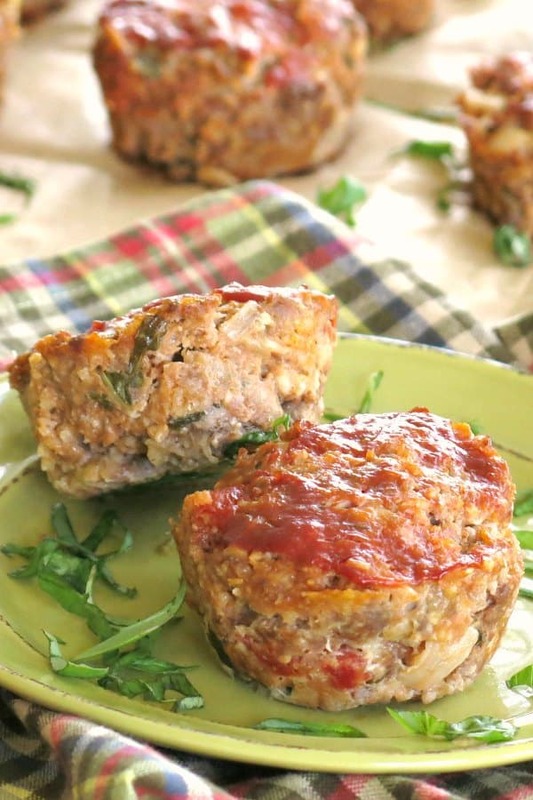 Baked Chicken Parmesan Meatballs and Turkey Meatloaf Muffins are all delicious variations that are in my freezer right now. Yep. I’m a big fan. So what makes this recipe gourmet? According to Dictionary.com, the adjective gourmet means: of or characteristic of a gourmet, especially in involving or purporting to involve high-quality or exotic ingredients and skilled preparation. Sun-dried tomatoes and fresh basil are the specialty items in this meatloaf and take this recipe beyond ordinary. Prepare it in a non-traditional way, such as muffin-size, and add to the presentation appeal. Choose your ingredients wisely, including the very best lean beef, preferably grass fed. We use oatmeal instead of breadcrumbs which absorbs the juices from the beef. Finally, prepare this meatloaf using our advice based upon making it thousands of times in our Meal Assembly Kitchen. You are sure to deliver a gourmet dish. We think Bacon Wrapped Meatloaf or “Mashed Potato” icing atop a Meatloaf Muffin also fit the definition. Package this recipe in any portion size including cupcake tins (makes 12) or a traditional meatloaf pan (serves 6-8). You can even make it into meatballs like we did for Easy Chicken Meatballs Baked in a mini muffin tin. The smaller the tin, the faster meatloaf cooks. 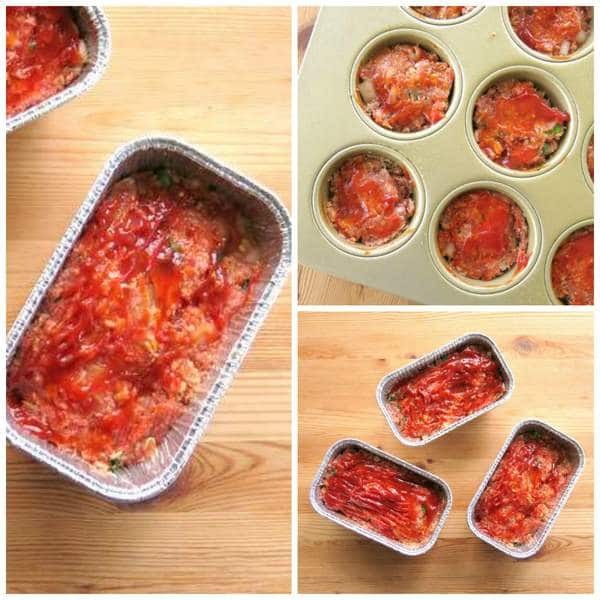 Allow about 30 minutes for muffin sized meatloaf and 45 minutes for mini sized bread tins. It’s best to use a meat thermometer to ensure meatloaf reaches the proper temperature of 165 degrees F.
Lean meat works great in this recipe because there is so much moisture from the cheeses. Other types of protein, such as ground chicken or turkey, work well in this recipe. Oatmeal can be replaced with breadcrumbs. Egg is optional. The cheeses do a very good job of holding everything together. Purchase sun-dried tomatoes in a package or a jar. They are sold whole or sliced. Slice whole sized tomatoes into slivers to get more bang for your buck! If you don’t have fresh basil on hand, dried basil will work…but, fresh basil is so worth it! Stack, roll and snip the leaves with kitchen scissors into thin slivers. Mix all of the ingredients together, except for the beef. Then, incorporate the beef. This process distributes the ingredients more evenly. Don’t over-mix the meatloaf of the beef will become tough. Double this recipe once you have all the ingredients out. Meatloaf freezes well. Once the ingredients are combined, shape meatloaf in the desired pan. Cover with plastic wrap and then a lid or aluminum foil. Store in the freezer for up to 4 months for best results. When you’re ready to cook the meatloaf, defrost it overnight in the refrigerator and then cook it as you normally would. Meatloaf may also be cooked from frozen, but it will take twice the time and it is very important to check the internal temperature. But, it’s an option! 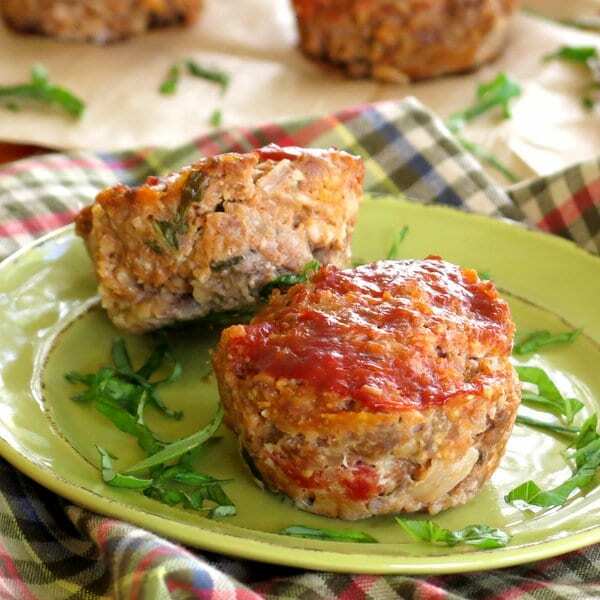 Enjoy gourmet meatloaf baked in a traditional loaf pan. Or baked in a muffin tin. Any way you cook it, this meatloaf is definitely gourmet! I guarantee you will turn into meatloaf lover when you try it! This gourmet meatloaf is bursting with flavor. Mozzarella and Parmesan cheeses, onions, fresh basil and sundried tomatoes take this comfort food to a whole new level of delicious! Add all of the ingredients except for the ground beef to a large bowl and mix well. Spread additional ketchup on top. Bake uncovered to a temperature of 160 degrees Fahrenheit. A one pound meatloaf will take about an hour. A mini meatloaf tin will take about 45 minutes and a cupcake size tin will take about 30-35 minutes. Allow cooked meatloaf to sit for 10 minutes before slicing. Meatloaf freezes well uncooked or cooked. Wrap container in aluminum foil and plastic wrap. Store in freezer for 2-4 months. When ready to cook, defrost in refrigerator for 24 hours and then cook as directed. 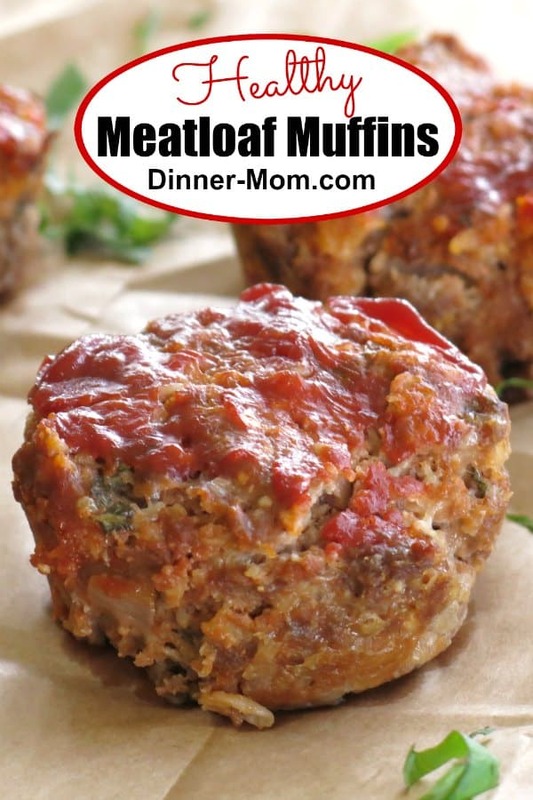 I love meatloaf muffins! I also love that you added sundered tomatoes, YUM! Who doesn’t love a good meatloaf recipe? And thanks for all those tips and tricks for shaping meatloaf and playing with additions! I love meatloaf, but I don’t make it nearly enough. I wish I had of had some of these meatless in the freezer after my daughter was born. Delish! My kids love meatloaf and I bet they’d love it in little sizes like this. I’d be a huge fan of the sundries tomatoes in there! 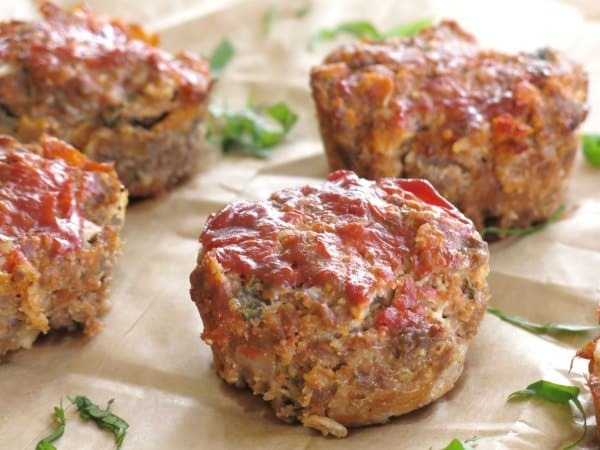 I have to make meatloaf muffins…why don’t I ever? They’re so fun and cute! Love that you added sun dried tomatoes. I can eat them just as they are so nice to make a meatloaf more exciting with them! My kiddos are huge fans of meatloaf too! And I think they’d gobble these up! These look fantastic!!! I can understand why a mom in labor would need to stop and order some first, before going to the hospital. LOL. Too funny, but a great testimonial on how delicious this recipe is! There’s a headline that says “Nutritional Information,” but nothing’s there except the serving size. 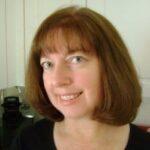 Where can I find nutritional info, especially carbs, fat, fiber, and protein? Hi! Thanks for your comment. We are in the process of updating all of our recipes with nutritional estimates. This one was just moved to the front of the line and the information has been added! This is a seriously delicious loaf!! We used turkey and well drained, oil packed sun dried tomatoes, it was perfect. Juicy, the oil from the tomatoes kept the turkey from drying out. The flavor can’t be beat! Thanks much! This was absolutely amazing ! Thank you dinner mom. I made a few tweaks, however. I used ground chuck bc I feel that to make a successful meatloaf, you gotta have fat. I also used progresso italian breadcrumbs bc of the added flavorings and I don’t like the texture that the oatmeal gives. I also love green bell pepper in my meatloaf so I added a half of one. I added a few good squeezes of shiracha ( I’m sure spelling is wrong lol ) hot sauce to add some kick to one of the batches. I made two batches, one spicy. I added a bit more breadcrumbs and another egg. The sun-dried tomatoes and fresh basil made this recipe one of my go to that I will make again and again … fat ground chuck 80% is what I used and imo is the only way to go. I only indulge about once a month so I’m not concerned with the fat content as much …. I served it with a golden potato garlic mash and a Pinot Noir … it was utterly divine …. Sounds amazing and thanks so much for the tips! I’m going to have to try sriracha!!! It’s my daughter’s favorite condiment! Thanks for suggesting the sun dried tomatoes…I added them to my mixture of: onion, garlic, celery, carrot, bell pepper, Parmesan, bread crumbs, eggs, red pepper flakes, Italian ground seasoning, basil, steak sauce, Worcestershire sauce and bread crumbs soaked in milk. I top my meatloaf with: ketchup, minced garlic and onions, brown sugar, steak sauce, Worcestershire sauce; put on during last 15 minutes. It was tasty…thank you! Your meatloaf ingredients sound wonderful! Thanks for your comment! Hello, I am a bit confused with the Oven temperature. Is it 180C or 160F? The oven temperature is 350F. The 165F reference is to the internal temperature of the meatloaf when cooked to a safe temperature. Use a meat thermometer to check. I’m making these for my freezer meal group!! :):):). …and one is cooking in the oven for me right now! :). Can’t wait to give these away to my grouofir Christmas! Thank you for the great recipe! Yum! Thanks for your comment! Enjoy!! !